Oh yes. We all dream of this. Working 4 hours a week, and then enjoying the rest of the time for things that we want to do, and don’t have to do. That would be the life, right? This is the idea behind this book, and I was really surprised by how the author really deliver his promise on how this can be done. First, do you really want to be independent? Can you handle it? If you were to have all the time in the world for yourself, what would you do? A lot of people don’t have a good answer for this. And if instead of working you are bored to death then sooner or later you will get depressed or crazy or both. So make sure that this is what you want. Second, stop being busy – “Being busy is a form of laziness—lazy thinking and indiscriminate action”. Create priorities in your life, work based on them. Don’t waste time in things that have no purpose. And quit early – if there is something that you are doing that you find during the process that it has no meaning/value for you, then stop doing it (this is the “sunk cost” fallacy that fails so many people all the time). Third, outsource your life as much as you can. Get a remote personal assistant to manage your meetings, accounts… basically everything. This is a process that needs to be done incrementally, but there are so many things that you can give others to do so you can focus on the things that really give you value and enjoyment. Fourth, find a business that will give you “automatic” income with minimum work. This is the most complicated part of the process. What can you create/build/provide to the world that people are willing to pay for and that requires the minimum amount of work from you? Obviously something that needs 1:1 personal interaction is out of the picture because it consumes too much time. The typical answer here is creating a product that people are willing to buy, find someone that can produce it consistently, outsource the management of this process and voila! Obviously this is oversimplified but you get the idea. And the best thing of the book is that it comes with many (hopefully) tested service providers that can help you achieve the goal shown in the book, from creating a company to hiring a virtual assistant and finding your dream vacation. The list is endless and full of great resources. 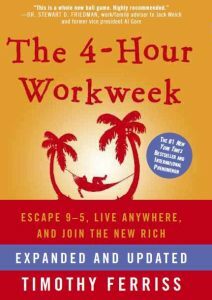 For sure, getting to a 4 hour work week is something that most of us will never be able to do, but we can learn and embrace some of the practices in the book to open up windows in our life and make it more enjoyable. Definitely recommend the book. Get it from your favorite online book shop.